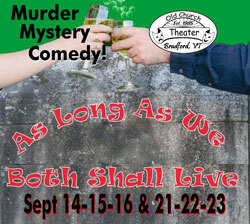 Presented at Bradford’s Old Church Theater’s new space just past FARMWAY at 176 Waits River Road, Bradford, VT, this play is PURE FUN and will have you LAUGHING THROUGH CURTAIN CALL! Sundays (September 16, 23) at 4pm. reservations@oldchurchtheater.org. Admission is $12, $10 for seniors and $6 for students. Remember, there’s nothing like live theater! Plus, Old Church Theater is heated, air conditioned, accessible with ample parking, so you’re in for a great evening or afternoon at the theater!